Shaun Ildefonso tries to go for an undergoal stab against UPIS. 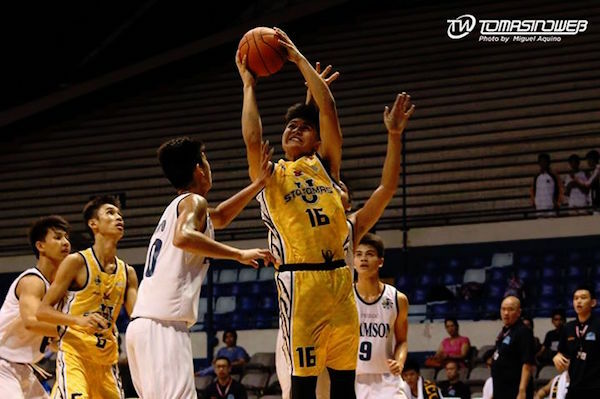 National University overpowered University of the East, 89-33, to stay unbeaten over the weekend in the UAAP Season 78 Juniors’ basketball tournament at the Blue Eagle Gym. John Lloyd Clemente had 18 points and 5 rebounds, Muhammed Sarip added 14 points and 9 boards, while Karl Peñano tossed in 12 markers for the Bullpups, who improved to 5-0. No Junior Warrior scored in double digits, with Daniel Ramos’s 8 points leading the way. 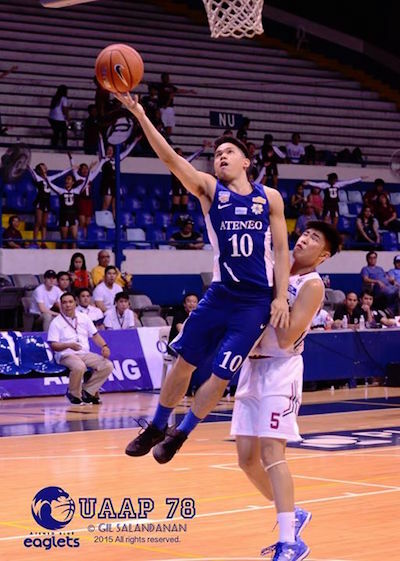 In other results, Jolo Mendoza shot 19 points as defending champion Ateneo bested UP Integrated School, 74-67, Aljun Melecio drilled in 17 points to lift De La Salle-Zobel to a 67-55 victory over Far Eastern University-Diliman, and Adamson University routed University of Santo Tomas, 76-45. The Blue Eaglets and the Junior Archers continued to share second place at 4-1. The Baby Tamaraws dropped to 3-2, while the Tiger Cubs and Baby Falcons both carry 2-3 slates. The Junior Maroons and the Junior Warriors are still winless after five matches. It was a tight affair between Ateneo and UPIS, with the Eaglets managing to just nose out the win in the final frame. 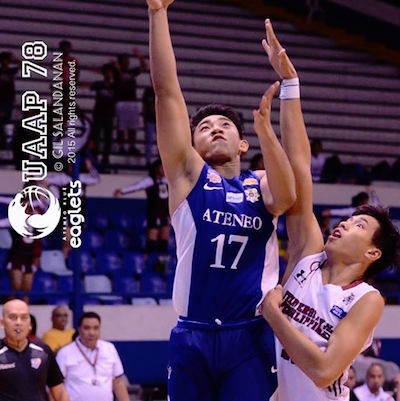 Gian Mamuyac dropped a dozen markers for the Blues, while Shaun Ildefonso recorded a near-double-double line of 11 points and 9 rebounds. The Junior Maroons’ Gomez de Liano brothers — Juan and Javier — paced their cause with 20 points apiece. 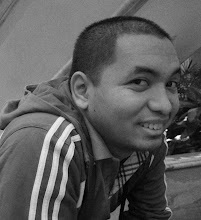 BJ Andrade smiles as Ateneo gets its fourth win in a row. 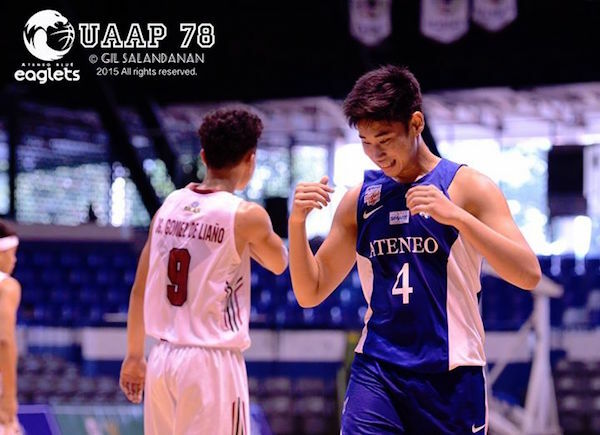 Jolo Mendoza continues to be the man of the hour for the Blue Eaglets. 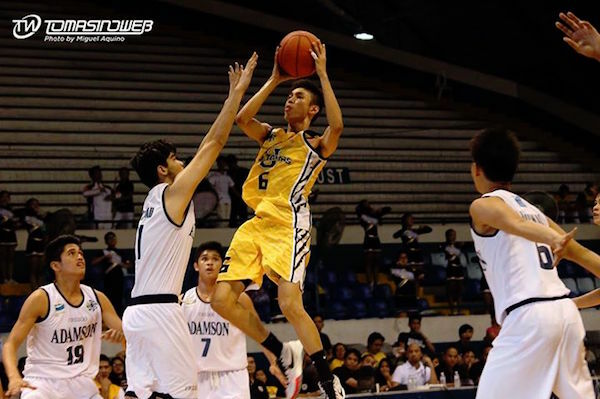 A big third quarter run proved to be FEU’s undoing in their match with the Junior Archers. Coach Boris Aldeguer’s wards outgunned the Baby Tamaraws, 25-10, in the third period to open up the game and wrest control. MR Romero and Joaqui Mariano backstopped Aljun Melecio’s production with 13 and 11 points respectively. The Baby Falcons of coach Goldwyn Monteverde reeled in only their second W of the season after subduing UST. Jayson Celis led the way for Adamson with 17 points, while Ralf Chua and Jose Antiporda each tallied 13 markers. As for the Tiger Cubs, Lakksman Ganaphat recorded a 15-point, 15-rebound double-double in their losing effort. Clark Ballada rises for the pull-up J against Adamson. Diego Morales dares to go up strong for the Tiger Cubs.